A-HOTEL.com - Halpa ja Hotellihuoneen Souvigny, Ranska. Majoituksen varaus Souvigny ja ympäröivä. Tätä ohjeellista tarjous on peräisin viimeksi varattu majoitus Souvigny ja lajitellaan alimmasta hinnasta. Voit valita majoitus mieleisesi suosittelemme valita yhteensä 2 tarjoaa majoitusta Souvigny. Syöttämällä haluamanne päivämäärät Souvigny ja käyttäen suodatin työkaluja voit lajitella parhaan mahdollisen majoituksen sinulle.Tuli haluamanne päivämäärät ovat ratkaisevia tarkin tarjouksen, koska se saa kaikki verkossa tietoa hinnoittelusta ja majoituksen saatavuus. Sitten voit varata valitun Souvigny majoitus (hotellit, jne.) heti. This guesthouse is located in Souvigny, in a listed building which is the former entrance of Souvigny's monastery built in the 17th century. Guests can enjoy the 1 hectare park. Housed in a neoclassical building, this B&B is on a 2-hectare park and a 20-minute drive from Moulins Train Station. It features free Wi-Fi access, an outdoor swimming pool and a terrace. Tätä Auvergnen alueen sydämessä 2 km:n päässä Coulandonin kylästä sijaitsevaa hotellia ympäröivät puutarhat ja puistot. Se tarjoaa lämpiminä kuukausina avoinna olevan ulkouima-altaan, aurinkoterassin ja järven, jolla asiakkaat voivat käydä kalastamassa. Offering free WiFi and city views, les bredins is an accommodation set in Saint-Menoux. This property offers access to a terrace. Classified as a Historical Monument, Château de Clusors is a 14th-century castle 7 km from Souvigny. It offers a heated outdoor swimming pool, a garden with outdoor furniture and a living room with a fireplace and a piano. Set in a 17th-century building with an outdoor swimming pool and a sun terrace, this B&B offers a view over Allier Valley. Guest rooms offer a garden view and Moulins Cathedral is located 5 km away. Appt "Coeur Moulinois" is a property situated in Moulins near Moulins Cathedral. Guests may enjoy the free WiFi. ibis Styles Moulins Centre is situated in Moulins' city centre, just 9 minutes' bus ride from Moulins sur Allier SNCF Train Station and a 6-minute walk from the Allier river. It offers comfortable accommodation with free WiFi. Tämä moderni hotelli tarjoaa matkailijoille erinomaista laatua ja mukavuutta sekä lämpimän vastaanoton, sillä tämä on yksityinen majoituspaikka, jossa on kodikas tunnelma. Voit tutustua eurooppalaiseen hotelli- ja ravintolaverkostoon, joissa on tuttu sydämellinen tunnelma. Built in 1834, this 4-star hotel features an outdoor swimming pool, a spa centre and a garden. Moulins Train Station is a 15-minute walk away and the city centre is 200 metres away. Situated in Moulins, 300 metres from Moulins Cathedral and 2.6 km from Centre national du costume de scène, La Demeure de Babette provides accommodation with free WiFi and a garden. La Maison de Gisèle is situated in Moulins historical district, 300 metres from the cathedral and 3 km from the train station. Featuring a big garden, free Wi-Fi and an outdoor pool. Situated a few minutes away from the Nevers Magny Cours race track, the ibis Moulins Hotel is an ideal location for exploring the historic city centre of Moulins. This accommodation boasts comfortable and functional air-conditioned guest rooms with free WiFi internet access and 2 rooms accessible for people with disabilities. Located 1.3 km from Moulins Cathedral, Hotel Restaurant Le Parc in Moulins features a terrace. Tässä Auvergnenin alueella sijaitsevassa hotellissa on 24h-vastaanotto ja huoneita, joissa on oma kylpyhuone ja ilmainen Wi-Fi. Paikan päällä on myös ravintola, kokoushuone ja ilmainen yksityinen pysäköintimahdollisuus. Le Clos De Bourgogne is set within an 18th century building in the heart of a green park. It is located in the town of Moulins, in the Auvergne region. 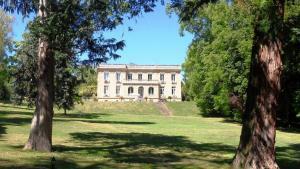 HotelF1 Moulins Sud is located in Yzeure, 46 km from Vichy and 4 km from Moulins. Every room comes with a flat-screen TV. Located in Bourbon l'Archambault, the Hotel des Thermes et des Sources is opposite the town’s famous thermal baths. It offers en-suite rooms with TV and free Wi-Fi. Located on the edge of the Auvergne region, this hotel offers en suite rooms with Louis XVI décor and direct access to the spa. It has a swimming pool with castle views, restaurant and free internet access in public areas. Set in a retirement and student home, Zenao Appart'hotel offers accommodation in Yzeure. The property features a terrace, a games room and a TV room.